Click on the image to go straight to the printable, or the "Read Post" button to read the corresponding blog post. If there is not an option to "Read Post," then there is not a blog post for that printable. One printable page that includes a grid with Monday-Friday down the left and a space to plan an art and fine motor activity for each day along with a selection of books to go with. Grid is blank so you can fill in your own plans. Print one copy, laminate or slide into a sheet protector and use with dry erase marker each week, or print several copies and hole punch into a binder to start fresh each week. Includes 6 printable pages with 2 craft stick pattern cards on each page. Use colored craft sticks to either lay on top of each card (matching the colors) or to lay underneath each card mimicking the pattern. Hide uppercase, magnetic letters in a sensory bin and use this printable to match each letter as it's found. Includes a printable for both uppercase letters and lowercase letters. Includes two separate counting activities for numbers 1-10 using fun, sunglasses clip art. Shape tracing activity for the following shapes: circle, square, rectangle, triangle, hexagon, and oval. For multiple uses, place in plastic sheet protector or laminate and use with dry erase marker. Includes: Rainy day draw, count & trace number words (numbers 1-12), rainy day draw & count rain drops (numbers 1-12), rainy day counting with do-a-dot stampers (numbers 1-8), rainy day counting clip cards (numbers 1-8), rainy day color word trace, rainy day read & color, and a rainy day pre-writing activity. Practice reading, tracing, and writing color words with fun, popsicle clip art. Print in color and practice finishing simple patterns by coloring the last image in each row. Patterns include ice cream cones and happy fish. Counting activity for numbers 1-6. Print on cardstock and either laminate or place in a plastic sheet protector. Create flower petals with play doh to match the number in the center of each flower. Counting activity for numbers 1-6. Color the correct number of petals labeled on each flower. 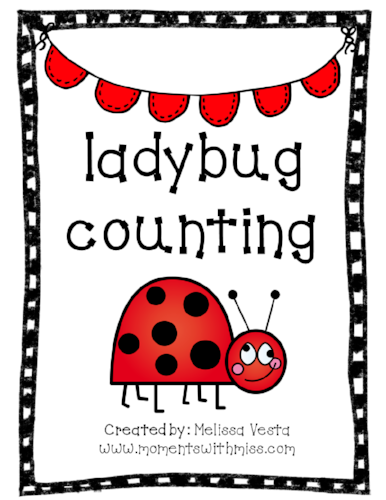 Printable includes 8 numbered ladybugs with corresponding white spots. Use black marker to color in the ladybugs' spots, use a q-tip with black paint, or cut out little black dots and glue. Activity includes two different printable sorting activities using sunshine, puppy dog, and popsicle clip art. Focuses on the following emotions: excited, happy, sad, mad. Blog post includes photos and explanation of the activity in use, and ideas for other ways to use the printables. Printable includes 8 "pancakes" (to be printed on brown paper) with different shapes on them, and 8 corresponding shapes to be printed on yellow paper to serve as "butter." Match the different shaped sticks of "butter" on to the different shapes on the pancakes. Great for pretend play! Printable includes black and white and colored version of printable shape match game. Includes the following shapes: circle, square, rectangle, triangle, hexagon, star, heart, and diamond (also includes a version that labels this shape as "rhombus" instead of "diamond"). Print in black and white or color, cut out shapes with dotted lines, and match to corresponding shapes. If possible, laminate the mats and the shapes and either use Velcro dots for matching, or attach to the fridge/a cookie sheet and use magnetic tape. 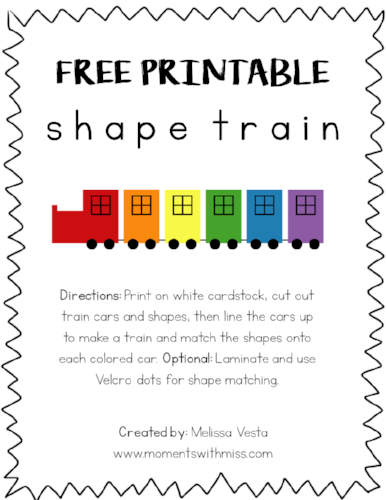 Printable shape train includes 6-car rainbow-colored train with a different shape on each car. Shapes include circle, square, triangle, rectangle, hexagon, and diamond. Directions for use included on the printable. Printable mats include a triangle, circle, square, rectangle, hexagon, diamond, and oval. Shape words are also included at the bottom of each mat in traceable format as a writing extension for older kiddos. Blog post includes explanation of how to use mats, explanation of how they were used with a two-year-old, and pictures of the activity in action. Mini activity pack includes: A color matching activity, a shape matching activity, and two different counting activities (numbers 1-8, and numbers 1-6). Blog post includes photos of how we used the printables, and other ideas for how they can be used. Mini activity pack includes: Red fish, blue fish do-a-dot stamping activity, red fish, blue fish color sorting mat, 2 separate fish bowl counting mats (use with goldfish crackers for a fun snack). Blog post includes pictures of the activities in action and an explanation of each. Includes uppercase letters A-Z that look like roads for little hands driving little toy cars. Great for letter identification and name practice! Uppercase block letters A-Z, great for name practice, and letter recognition activities. Blog post includes photos and description of a name activity along with a list of other ways the letters could be used. Includes 6 different cupcake Valentine cards. Blog post includes photographs of printed and completed Valentines. 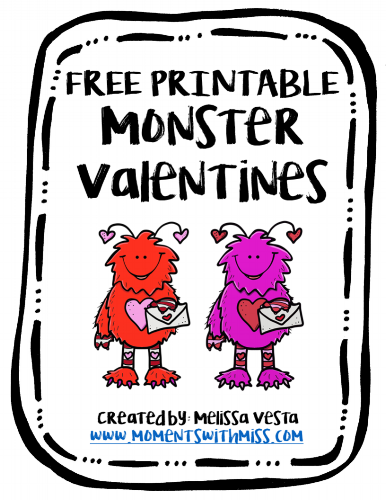 Printable includes 6 different monster Valentine cards. Blog post includes photographs of printed and completed Valentines. 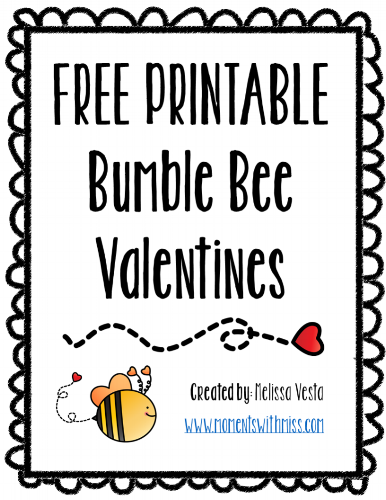 Printable includes 6 different bumble bee Valentine cards. Blog post includes photographs of printed and completed Valentines. Includes: Mitten Shape Match, Mitten Counting Mats (#1-6), Mitten Color Match, and Mitten Size Order. Blog post includes two additional mitten-themed activities along with photographs and explanations of each activity. Includes 7 sets of Christmas picture cards to print, laminate (optional) and match. Blog post includes pictures of activity in use and ideas of how to set up and use the activity. 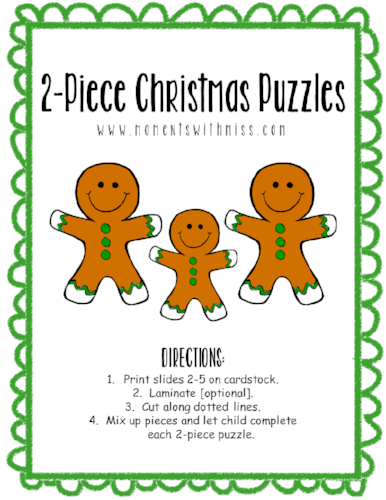 Blog post includes 9 different 2-piece Christmas puzzles to print, laminate (optional) and cut. Blog post shows pictures of activity in use and one additional activity idea. Includes one Christmas mini book/easy reader that focuses on sight words "I," "see," and "a" as well as color words. Great for children who are learning to read and who like to color! Blog post includes pictures of the mini book in use and tips on using the easy reader most effectively. Pack includes: Do-a-dot 'A is for Apple" activity, red, green, and yellow labeled color sorting apples, 3 plain white apples, 1 large white apple, apple tree color matching printable. Blog post includes a total of 9 different apple-themed activities for kiddos, activity ideas to go along with the printables, and pictures of all the activities in action.